Sherway Gardens has raised over $32,000 through a popular Santa Claus attraction to donate to an organization that provides bed kits for children in developing countries. The mall began selling tickets to the Santa Experience in November and throughout December. It raised $32,309 that was donated during a ceremony this morning at the mall to Sleeping Children Around the World. 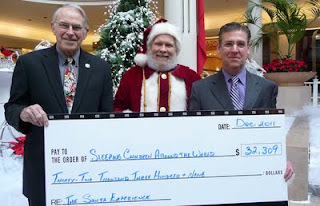 "Since 2002, Sherway Gardens has proudly donated 100 per cent of the proceeds from the Santa Experience to Sleeping Children Around the World," said Sherway's general manager Andy Traynor. "To date, $204,825 has been raised through ticket sales for the Santa Experience which has gone toward helping over 5,000 children worldwide." The Santa Experience allowed children to join Santa Claus for an interactive play session that included sing-a-longs, dancing and story time. Children also got to share with Old Saint Nick what they wanted for Christmas and pose for a photo. 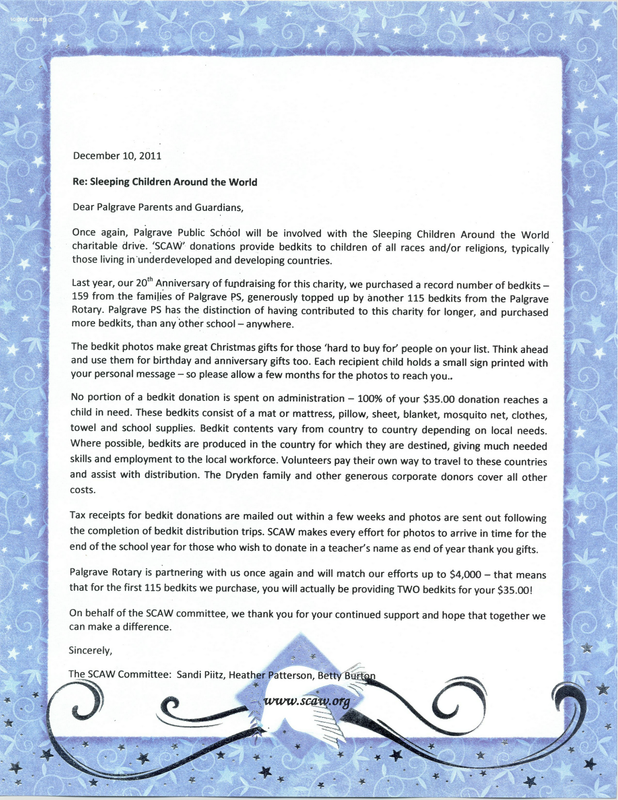 "It's such a great thing to think that a happy time such as Christmas, where our children are celebrating and having their pictures taken with Santa, can lead to many kids overseas getting bed kits," said Sleeping Children Around the World chair Dave Dryden. "As a result of the support (we have) received from Sherway Gardens, we have been able to provide approximately 6,000 bed kits to children in countries around the world including India, Kenya, the Philippines, Uganda, Sri Lanka, Tanzania, Honduras and Bangladesh. We can't thank them enough." As published in The Toronto Star, December 18, 2011. Peter Adams represented Peterborough for the Liberals from 1993 to 2006, threw his energy into Sleeping Children Around the World, which distributes bedkits (a mat, a sheet, a blanket, a mosquito net and 20 other items) to children in poor nations where thousands die of malaria. He and his wife Jill have travelled to India, Bangladesh and Honduras on Sleeping Children missions. As published in The Barrie Examiner, December 20, 2011. Thank you to all those who supported the 2011 Gifts That Give Fair which took place Nov. 26 and 27 at St. Mary's Church Hall. The diversity of initiatives in social justice, environmental awareness and aid and development being undertaken in our community and in the developing world was enthusiastically represented by the Elizabeth Fry Society, Barrie Fair Trade Working Group, Hospice Simcoe, Simcoe Sojourners Friends of L'Arche, Sleeping Children Around the World, Birthright, Grandmothers to Grandmothers, Canadian Food for Children, Candlelighters Simcoe, Parents of Children Living with Cancer, Kids for Turtles, One Tribe Wasafiri, Bridget Gallagher's Fair Trade Co., Chalice, DreamyZ's and Ten Thousand Villages. Thanks also to these participants and their volunteers for providing us with the opportunity to purchase gifts while supporting some of the good work happening in our community and around the world. As published in the Listowel Banner, December 28, 2011. By looking at issues in Somalia, Attawapiskat and Sleeping Children Around The World, the students discussed themes of giving and not taking things for granted. They said they realized how lucky they are and chose to do something nice for those without. The students then collected 29 new toys for boys and girls and $110.68 for the local Salvation Army. As posted on mississauga.com, December 16, 2011. Spencer Cobbold has only scored three goals in his Ontario Hockey League career, but the Mississauga St. Michael's Majors rookie's most recent goal, scored tonight at the Hershey Centre was the most significant. 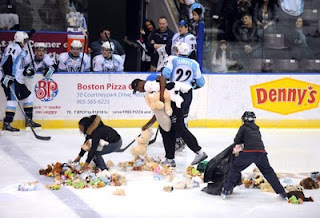 Not only did it open the scoring in a 3-1 win over the Kingston Frontenacs, but it also sparked an avalanche of stuffed toys thrown onto the ice in the Majors' annual teddy bear toss game. All bears that hit the ice will be donated to the Boys and Girls Club of Peel and proceeds from bears purchased tonight will be donated to Sleeping Children Around the World, an organization that sends bed kits to children in developing countries. "It was a big game for us," said Cobbold, who broke a 19-game goalless drought. "Getting the goal was good and then all these teddy bears coming down was pretty cool so it was definitely a big goal." The win snapped a three-game losing streak for the Majors (15-14-1-3) and occurred three weeks after the Frontenacs came back from a 3-1 deficit to beat the Majors 4-3. The Majors are eighth in the OHL Eastern Conference while the Frontenacs sit in last place. However, Majors coach/general manager knew what to expect from the Frontenacs, who he feels are playing better than their 9-20-2-2 record indicates. "We knew coming in Kingston has been playing a lot better lately," Boyd said. "They got a big win in Belleville Wednesday so we knew they were going to play hard. We had to bring our competitive level up and I thought we did a good job of that." Cobbold's goal, scored 2:11 into the second period, was also the most bizarre of his short career. He fired an innocent-looking point shot towards Kingston goalie Igor Bobkov, but Bobkov caught it and accidentally threw it into his own net. Other than that blunder, Bobkov was solid with 32 saves on 35 shots, but Mississauga's J.P. Anderson had an even better outing. He stopped 34 of 35 shots. Shortly after the opening goal, Majors centre Brett Foy was hurt by an elbow to the head by Conor Stokes, who was slapped with a game misconduct. He was helped off the ice and didn't return. "Anytime you lose a player who plays regularly and kills penalties, it's going to make a difference," Boyd said. "Hopefully Brett's alright. That's our main concern." The hit will be reviewed by the week within the next few days and a suspension for Stokes is possible. The Majors have lost two players to injury in the past three games. On Sunday, Mississauga captain Stuart Percy was hurt after he went head first into the boards following a hit from Ben Thompson of the Kitchener Rangers. Percy suffered a sprained wrist, whiplash and a cut on his cheek requiring stitches. He isn't expected to be out of the lineup for a long time. Kingston's Darcy Greenaway tied the game midway through the second with a one-timer past Anderson, but Mississauga defenceman Dylan Demelo restored Mississauga's lead with a shorthanded marker 1:10 later. Demelo, who picked up an assist on Derek Schoenmakers' third-period goal, one-timed a pass from Jamie Wise with teammate David Corrente serving an interference penalty. Defenceman Alex Cord contributed to the Majors attack with two assists. Both teams went scoreless on the power play. Mississauga was shutout on four chances while Kingston failed to capitalize on six opportunities. The Majors will host the Sudbury Wolves Sunday at 2 p.m. in their final game before the league's Christmas break. The Wolves, winners of eight out of their last 10 games, sit one point ahead of the Majors for seventh in the Eastern Conference. For the Browne family in Sherwood Forrest, what started out a decade ago as a holiday get-together with neighbours and friends has developed into a fundraising juggernaut. At first it was just having drinks with the neighbours at Christmas. The Brownes would collect a few toys and some cash for a good cause. It was five years ago that Jim Browne heard of the great work being done by Sleeping Children Around the World, an organization that donates bed kits to children in underdeveloped and developing countries. Each bed kit contains a mat, pillow, sheet, blanket, clothing, towel, school supplies and a mosquito net, if needed. The family adopted that cause and moved their Christmas cocktail fundraiser to the Rosewood Bistro in the nearby Sherwood Forrest Village Shopping Centre. Last night, the party took over the entire top floor of the restaurant. The Sleeping Children program was founded in 1970 by Murray Dryden. While on a trip in India, Dryden tripped over a sleeping child in the streets. He realized that while he may not be able to end world hunger, he could provide a child with a good night's sleep. "If these kids don't have the money for a school uniform, they can't go to school," says Browne. "We do this because you've got to give back," he said in an interview this morning. "These kids have nothing." 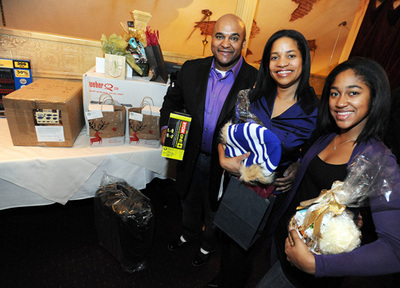 Last year, the annual Holiday Cheer gathering raised enough money to buy 150 bed kits for the program. After last night's event, another 168 new kits will be purchased with the almost $6,000 that was raised. Not bad for a giving tradition that Browne notes, "just started with getting a few neighbours together for drinks at Christmas." A letter sent to Palgrave Public School parents. 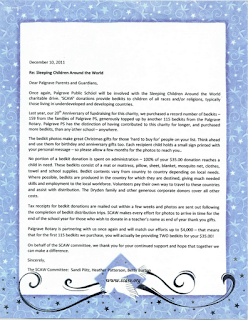 Once again, Palgrave Public School will be involved with the Sleeping Children Around the World charitable drive. 'SCAW' donations provide bedkits to children of all races and/or religions, typically those living in 'underdeveloped and developing countries. Last year, our 20th Anniversary of fundraising for this charity, we purchased a record number of bedkits -- 159 from the families of Palgrave PS, generously topped up by another 115 bedkits from the Palgrave Rotary. Palgrave PS has the distinction of having contributed to this charity for longer, and purchased more bedkits, than any other school - anywhere. The bedkit photos make great Christmas gifts for those 'hard to buy for people on your list. Think ahead and use them for birthday and anniversary gifts too. Each recipient child holds a small sign printed with your personal message - so please allow a few months for the photos to reach you. No portion of a bedkit donation is spent on administration - 100% of your $35.00 donation reaches a child in need. These bedkits consist of a mat or mattress, pillow, sheet, blanket, mosquito net, clothes, towel and school supplies. Bedkit contents vary from country to country depending on local needs. Where possible, bedkits are produced in the country for which they are destined, giving much needed skills and employment to the local workforce. To read more, click on the graphic. Sleeping Children is still being mentioned on the Web as one of many worthwhile charities. As published by The Montreal Gazette, December 14, 2011. Wilder Penfield Elementary: Wilder's spiritual animator, Rosalie Shewchuck, will be visiting each class creating awareness of important topics like poverty and how to best connect with the families students will be helping this year. Students will also learn to reflect on the many benefits that giving offers to others and to ourselves. For many years Wilder Penfield has supported the Sleeping Children Around the World Campaign. Every year, each class collects money to help provide a safe, comfortable night's sleep for children around the world. This money is used to purchase items like sleeping bags, pillows, mats, mosquito netting, pyjamas and toiletries. Sleeping Children has been mentioned several times on the Web these past couple of weeks. This organization was founded by Murray and Margaret Dryden in 1970. It provides bed kits to children in developing countries. Each $35 donation provides a mat or mattress, pillow, sheet, blanket, mosquito net (if applicable), clothes, towels and school supplies. No portion of a bed kit donation is spent on administration. Traveling volunteers, at their own expense and without benefit of a tax receipt, go to countries to supervise the distribution of bed kits, photograph children with their bed kits and write articles for the donor newsletter. Cost: $35 for one bed kit. "The “Lip Charmours” have set a team fund-raising goal of $3600 and Busch Systems also is involved in various charitable efforts such as Christmas Cheer, United Way, Big Brothers/Big Sisters, Barrie Food Bank, Red Cross for Haiti Relief and Sleeping Children Around the World." "The interactive Santa experience is nothing new for Etobicoke’s Sherway Gardens mall, also a Cadillac Fairview property. It’s been offering a six-day-a-week, 45-minute pre-registered session for children with Santa since 2001. About 6,500 children signed up for this year’s sold-out Santa Experience sessions, which include storytelling and games and take place in full view of shoppers. It costs $5 per child, with all proceeds going to a charity that provides bed kits to kids in developing countries, called Sleeping Children Around the World. Since the interactive Santa experience started, Sherway has raised more than $200,000 for the charity, says Lisa Resnic, senior marketing director at the mall. And get this: It was Santa himself who suggested getting rid of the typical mall approach. It was taking up to 3 ½ hours of standing in line before children got to see Santa. “He said, ‘By the time the children get to see me, they’re not very happy,’’’ Resnic explained. “He came up with the idea that we should do something interactive, be more engaged.’’"
"Sleeping Children Around the World (SCATW): A workshop outlining the efforts of SCATW to provide bed kits and school uniforms to children in struggling societies around the world. " 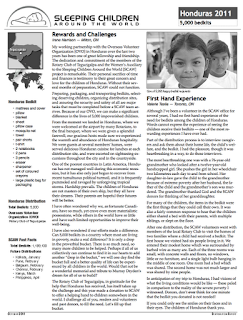 The donor newsletter for the Honduras bedkit distribution has gone to print and can be downloaded from the Sleeping Children Website. Photos are available in the Honduras 2011 Photo Album. You can view them by clicking the link above. The random acts of kindness philosophy was continued at Delmanor Glen Abbey as Betty Fry, a Delmanor Glen Abbey resident, challenged the Delmanor seniors to raise funds for The Sleeping Children Around the World organization. The S.C.A.W raises funds to provide bed kits to the neediest of children in underdeveloped and developing countries. The Glen Abbey residents wished to continue the fantastic work of the Ken Dryden family and the United Church. The Sleeping Children Representative was overwhelmed when the Delmanor Residents presented her with $300 collected over the month of November! The residents of Delmanor Glen Abbey were honoured to help raise funds for this very worthy cause. They will always remember the heartfelt emotions that came with assisting underprivileged children around the world.